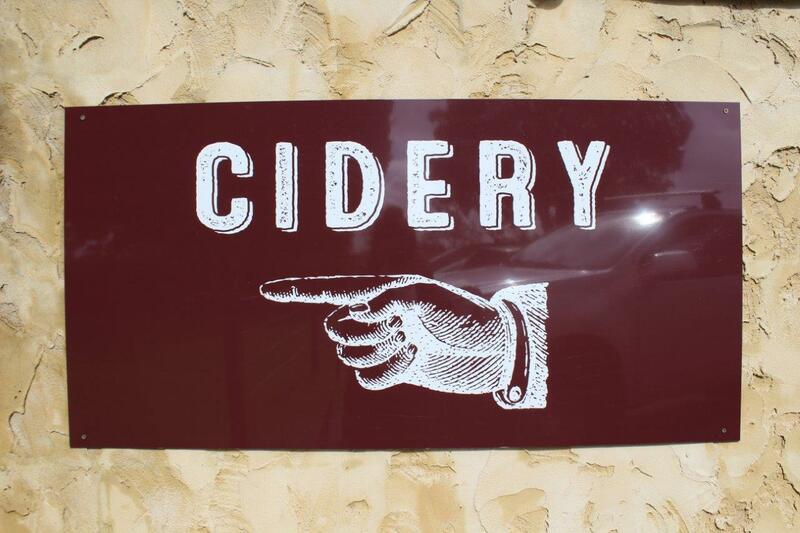 That's right, these guys make cider that is actually GOOD for you! There is nothing better than a freshly poured frosty pint of heavens nectar - I’m talking about cider of course. In the search for the perfect brew, I admire its golden glow as it is poured all the while anticipating that very first sip. What comes next will either be pure joy or bitter disappointment. Four brothers certainly deliver the former - and have possibly ended my search. Not only do Four Brothers produce an apple cider that is perfectly semi sweet, crisp and easy to drink, it is non-pasteurised and completely free of preservatives. 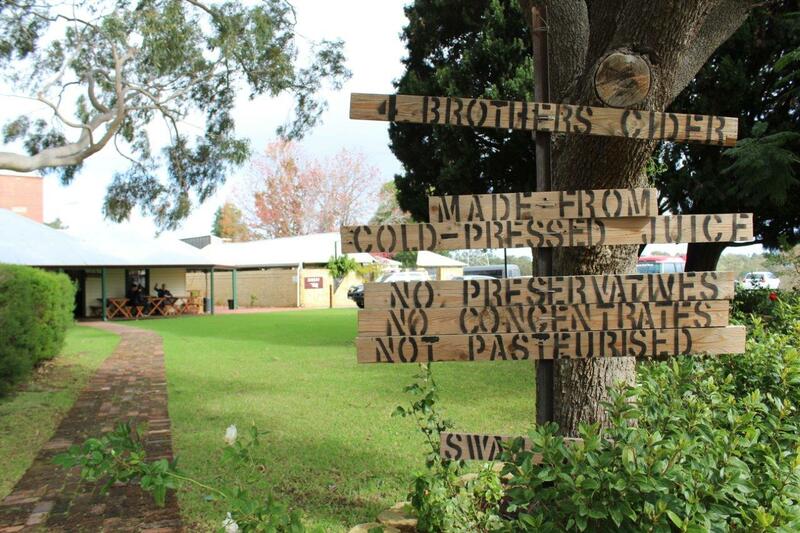 This passion for producing a healthy product from quality West Australian produce was the driving force that saw these four brothers come together to start the first dedicated cidery in the Swan Valley - and you really couldn’t find a nicer group of guys if you tried. Their passion for what they do is inspiring, and boy do they have some great stories to tell! 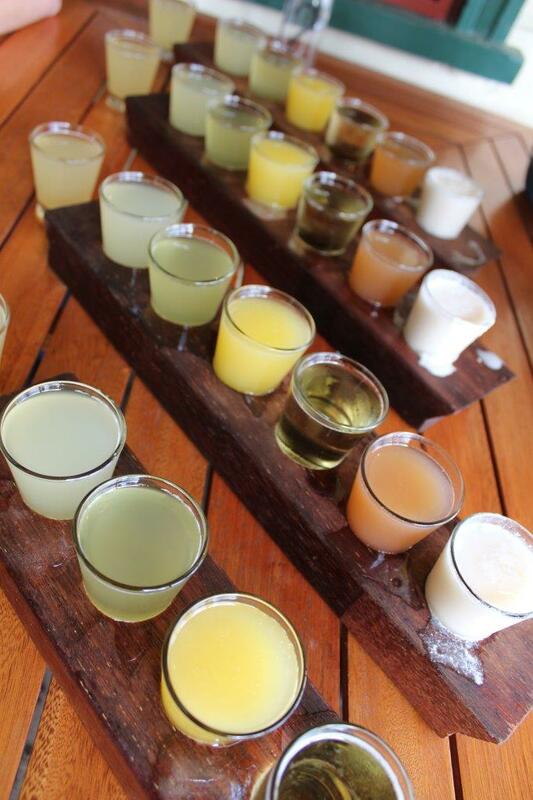 As well as producing fantastic apple (made with crisp Granny Smiths) and pear ciders, they also produce unique coconut, mango, lemon, strawberry, ginger and passionfruit ciders as well. Unlike other flavoured ciders, these are not made with concentrate, syrups or flavouring- just real fresh fruit from local farms. Well balanced, and not too sweet, these perfectly showcase the fruits natural flavours- and the coconut is to die for. As well as these, the boys will make other limited edition batches if a grower drops off something really delicious- past versions have included peach, pineapple and for this weekend they served up a mixed berry version. Upcoming creations include a blueberry coconut cider and a low alcohol content pineapple wine so the skippers don’t have to miss out! Dustin Michael and his younger brother Martin are country boys who grew up on a farm north of Toodyay. Four and a half years ago they turned their passion for health and nutrition into a juice company, which after a couple of name changes is now known as Michael Brothers Juice. Cold pressed and hand-bottled in a small tin shed in the Swan Valley, it is just like the cider; preservative free and non-pasteurised. They use only locally sourced fruit and vegetables bought directly from the farm, limiting it’s time in transit and storage to ensure it is as fresh and full of nutrients as possible. After attending the Taste of Perth festival three years ago to promote their juices, Dustin was excited to talk to a cidery owner who he thought produced preservative free cider. After inquiring about it, he was told that wasn't the case, and that it is impossible to produce cider without adding sulphites. 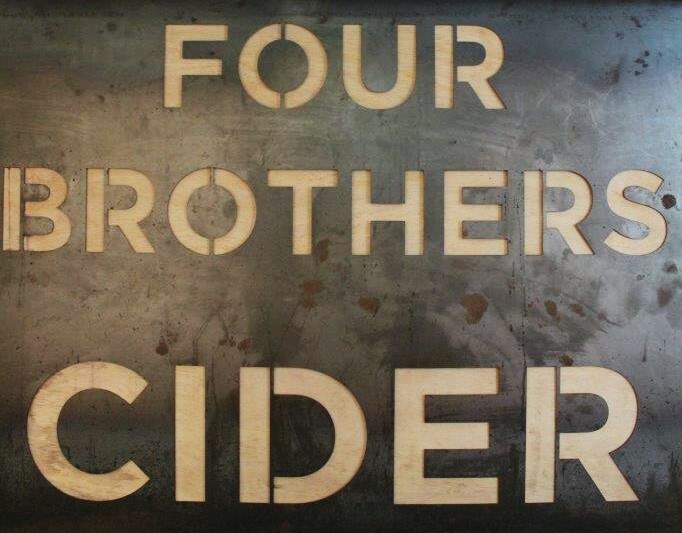 Inspired to prove them wrong, nine months ago Dustin and Martin combined with brewer brothers Peter and Adam from Iron Bark next door to create ‘Four Brothers Cider’ using their cold pressed apple juice as the base for all their ciders. Although it is not necessarily easy to do it this way, and definitely has a method to it, Dustin says he finds it a simpler and more natural way to brew cider. Dustin says he is amazed that no one else puts effort into making preservative free craft cider. He says that it’s not like they can’t do it, they just don’t want to do it right or they aren’t trying hard enough. Knowing that the preservatives that are added can be linked back to all sorts of medical problems, Dustin says it shouldn’t be added if it isn’t necessary. What’s worse is that some companies that misleadingly label themselves as ‘organic’ but still use preservatives. As if you needed another reason to try their range, the American Medical Association has recorded in their journals that un-pasteurised preservative free apple cider heals the liver, kidneys and digestion- just like red wine is good for the heart in moderation. Not to mention that preservative free beverages won’t leave you feeling like your in a world of pain the morning after a night of excess consumption. Dustin says the local food movement has been great for local farmers, and in turn makes it easier to source different fruits for their juices and ciders all year round. The raspberries they use come from a farmer just up the road who started out very small, and now thanks to the movement has grown exponentially. They are extremely happy to be able to support other small businesses and work together to create something amazing. 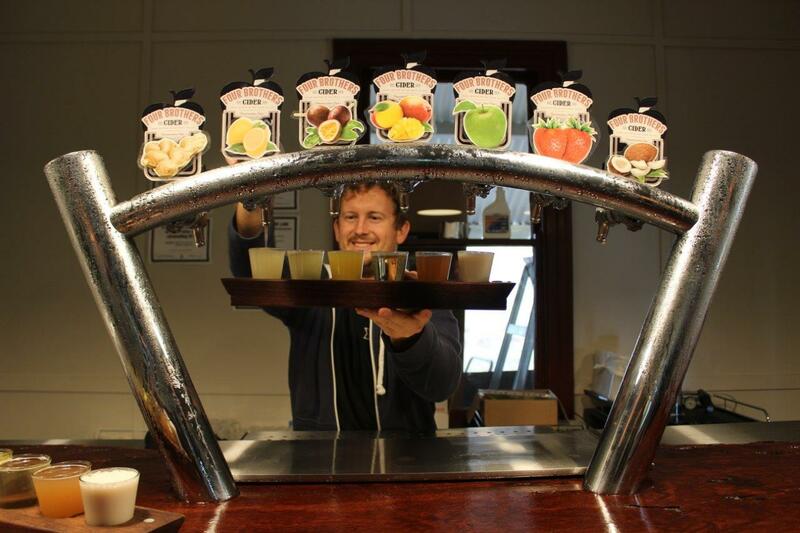 All their juices (bar one due to the inability to grow ginger in WA) have the Buy West Eat Best tick of approval, and they are in the process of having their cider certified also. After taking out the people choice award at last year’s Fremantle Beerfest, the boys are looking forward to competing in the Australian Cider Championships in October. 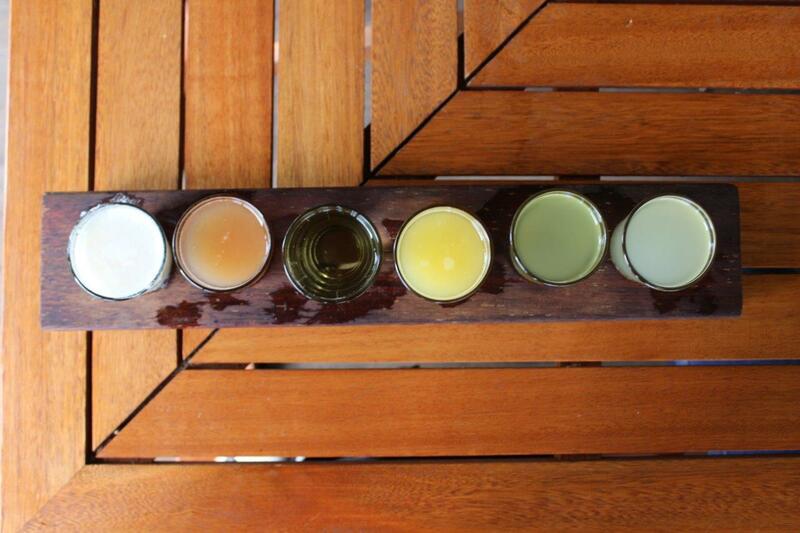 You can visit Four Brothers and enjoy a tasting paddle of all their flavours for just $14 dollars- and then maybe a pint or two more of your favourite. If you really love it and can’t get enough, you can bring some home in a 1 litre squealer- but it’s not available to purchase in bottled form at the shops…yet. You will also be able to find their apple and pear on tap at a couple of bars like the Windsor and the Hen. For the moment they are enjoying being a destination, and keeping it exciting and exclusive. You can also find their Michael Brothers juices widespread across Perth, in cafes and IGA’s alike. You can enjoy a couple of pizzas with your pints courtesy of the neighbouring restaurant until they can gear up to do it themselves. In the future they hope to be a pork and cider venue- with a friend who owns a free range pig farm back home as a supplier, Dustin has been experimenting with marinating pork in their cider before cooking (the result is said to be delicious). I personally can’t wait to try it! Open Thursday to Sunday 11am until late- if people keep turning up, the boys will keep pouring. If you pop by for a visit and realise it’s not a trading day, you will probably still be served. 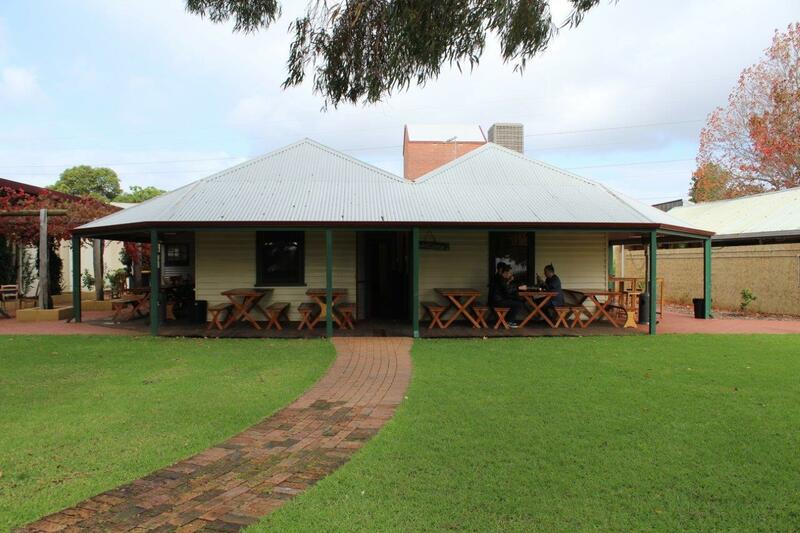 This little slice of heaven is located at 55 Benara Rd, Caversham WA (right next to Iron Bark brewery). Check them out on their Facebook or for a great read head to their website. You can also find out more about their juices here and here.